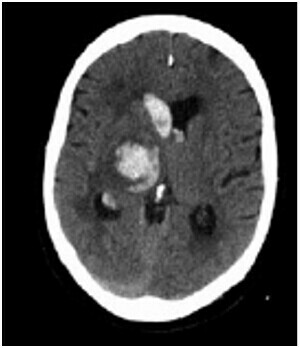 The proportion of stroke due to intracerebral hemorrhage is higher in developing countries. This is explained by the difference in risk factor profile with hypertension being the single most common factor in developing countries. Stroke mortality is also quite high in developing countries due to lack of treatment modalities and delayed presentation of patients. In the paper the team shows that the prevalence of atrial fibrillation among ischemic stroke patients was quite higher than reports in other studies. Greffie said "In a rural community where the acquired risk factors for stroke due to urbanization are not so common, cardioembolic stroke due to atrial fibrillation and other structural heart diseases could be the main reason for ischemic stroke. The significance of this finding is that most of the ischemic stroke could have been prevented if these patients were picked earlier and put on prophylactic anticoagulants." The mortality of stroke was high in the study. “Given the poor capacity of the hospital to emergently diagnose and manage complications of stroke and the relatively higher occurrence of the grave intracebral hemorrhage, the high mortality is an expected finding.” said Greffie. Finally, the study team recommended that appropriate screening and treatment of the two giants, hypertension and atrial fibrillation, in the developing community is invaluable for the prevention of stroke. And as stroke is becoming a common threat, hospitals should be better equipped with a setup capable of managing stroke and its complication and rehabilitation. Improving the awareness of the community in the subject is also very important.